Marvel Comics and DC Comics have occasionally crossed-over. It hasn't occurred for awhile now (the most recent time that springs to mind is "JLA/Avengers" in the early 'Oughts) and nothing much since then. 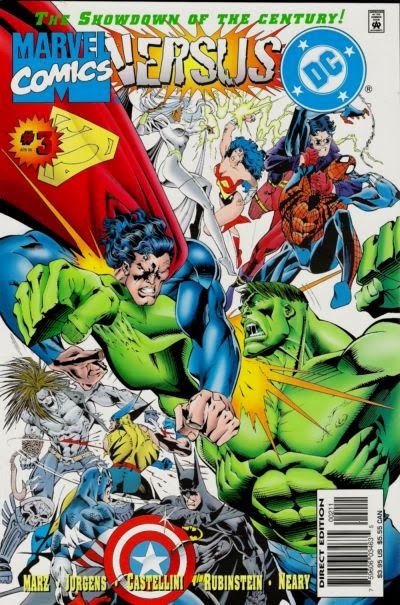 However, back in the 1990s all sorts of cross-overs seemed to happen and one such event resulted in this strange mish-mash of comics known as the Amalgam Universe/Imprint. Springing out of "DC Versus Marvel/Marvel Versus DC", one product of the event was something half-owned by Marvel and half-owned by DC, Amalgam. 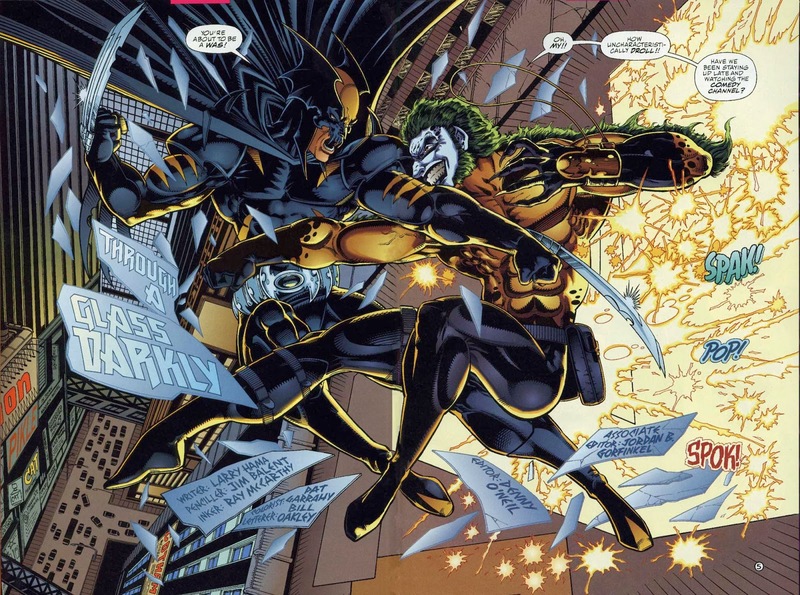 Amalgam was a surreal sort of alternate-universe of comics where for (fictional) decades there had been strange characters that were a combination of various Marvel and DC heroes. Some of the comics had letter pages from (again, fictional) fans, there were references to "past" events, basically everything was a strange printed piece of make-believe except for the writer and artists on the comics still using their real names (and the tiny legal print admitting that yes, this was a comic by DC or Marvel). 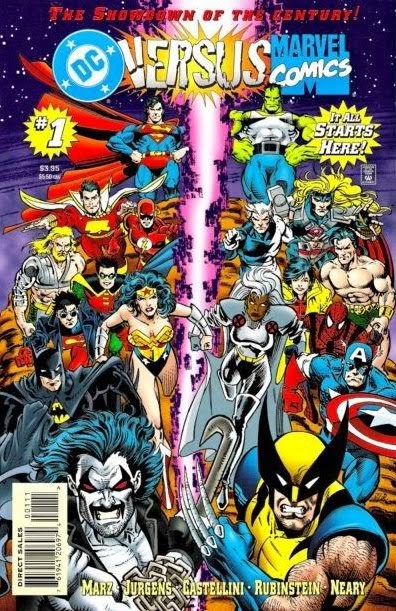 The initial cause of this Amalgam Universe was rooted in a story of Marvel and DC's Universes colliding in the form of two cosmic "brothers" or something which resulted in heroes needing to fight things out, followed by the merging and eventual re-separation of each imprints respective Universes. When the aforementioned "merge" happened there was a week where instead of Marvel or DC releasing their own comics 12 "Amalgam" comics came out. Later on in time there were other Amalgam comics apparently, but those were done more for fun than any story reason. 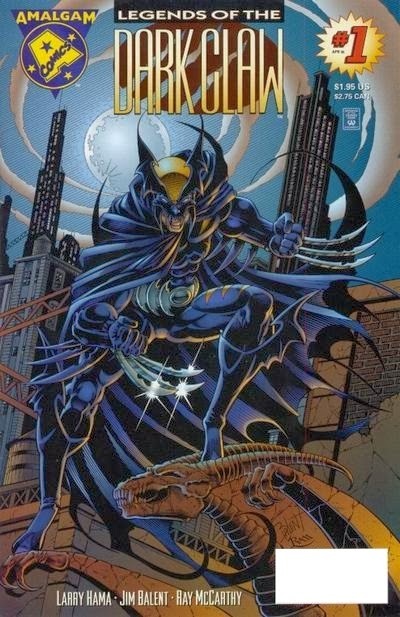 One of the such initial Amalgam comics that I came upon when I was rooting through the dollar bin one day was this interesting curio of two extremely popular characters meshed-together, with the end result of Dark Claw. 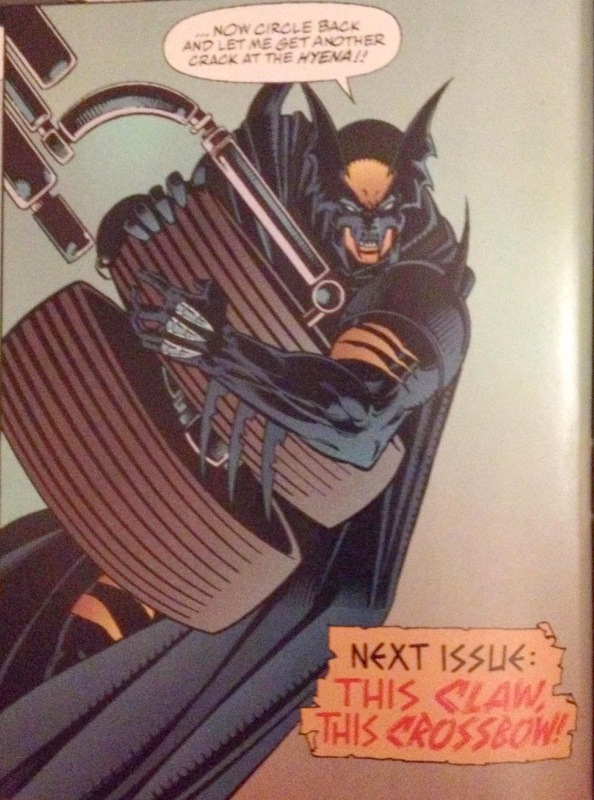 Dark Claw is basically a combination of Wolverine and Batman to result in a weird mixture of the two. His name is Logan Wayne, he saw his parents gunned down at the age 5, he works out of New Gotham City (New York City plus Gotham City, get it? ), and his arch-enemy is still Creed, but instead of being Sabertooth he is the Hyena and clearly a close analogue of the Joker. It is mentioned he is a mutant and has a healing factor, and his side-kick is clearly longtime ally Jubilee, but here is known as "Sparrow". I could go on about all the interesting links (Carol Danvers/Captain Marvel is basically Catwoman but called "Huntress", another DC hero), but instead I'll talk about the comic itself. "Legends of the Dark Claw" is well-written by the very able Larry Hama, and well-drawn by Jim Balent who while now being known for his (extremely) sexually charged "Tarot" comic-series made some good comics back in the day while keeping cheesecake to a relative minimum. Note: I said "relative" minimum. This would never be continued of course, because Amalgam was a temporary thing and before long DC and Marvel were made separate worlds once more. Seeing any of the Amalgam characters again seems all but impossible at this current moment in time with relations between Marvel and DC appearing to be slightly chilly at best. Still, seeing this glimpse into what almost feels like some other dimension's comics is fun, and it helps that "Legends of the Dark Claw #1" was a well-written and nicely-illustrated read. While it may be highly unlikely we'll be visiting the Amalgam Universe again anytime soon, at least there are some interesting comics left behind from this crazy experiment, and they definitely make for a great...tale from the dollar bin!